Amusement parks first appeared in Europe as more permanent sites for amusements and entertainments which had previously traveled from town to town in carnivals and circuses. The parks could trace their roots to medieval minstrels and troubadours, first retained by royal courts and wealthy nobles, but who later performed in the streets and at fairs and festivals for commonfolk. In England, "pleasure gardens" in the form of resort grounds operated by inns and taverns first emerged in the 1550s, and gradually expanded in size and diversity. Copenhagen has the two oldest permanent parks, with its Klampenborg dating to 1583, preceding its better-known Tivoli Gardens opened in 1843. In London, Vauxhall Gardens opened in 1661 on a 12-acre site with free admission and entertainment including acrobatic acts, fireworks and music (Mozart performed there as an 8-year-old prodigy in 1764). Traditional celebrations and festivals also lent themselves to adaption for more permanent centers; in 1810, for example, a celebration of a Royal wedding in Germany unexpectedly continued for over two weeks, evolving to become Munich's annual Oktoberfest featuring a carnival with carousels to accompany the tents of breweries serving beer and food. In the 19th century, world's fairs and expositions, which began with the Crystal Palace exposition in London in 1851, also provided a model for how centers with a mix of rides and diverse dining and entertainment options could attract thousands of visitors. The fairs also became a showplace for exposing the public to the newest technology and products of the day. 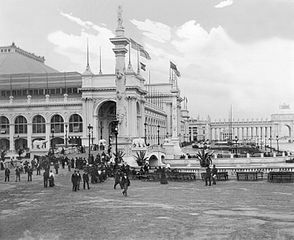 The World's Columbian Exposition of 1893 in Chicago, for example, included a dedicated amusement and concessions area with rides, including a precursor to the first Ferris wheel. Although the fairs were primarily intended as a place for highlighting innovation, the popularity at the world's fairs of midways with amusements, rides and games sparked interest by entrepreneurial showmen in the profit-making potential of more permanent amusement complexes. A year after the end of the Columbian Exposition, Captain Paul Boyton, a Civil War Navy veteran and entrepreneur, opened in Chicago his Boyton's Water Chutes featuring a boat taking riders down an inclined slope into a body of water, with his park cited as the first ever to charge admission and use rides as its primary draw rather than as a complement to more traditional parks or expositions. One of the largest of the permanent parks evolved at Coney Island in Brooklyn. The area initially had been developed after the Civil War with large beachfront hotels for the wealthy, but gradually expanded to offer other attractions such as vaudeville theaters and horse racing tracks. In 1876, a carousel of hand-carved horses and animals began operating at a bath-house complex, which was followed by other rides and amusements. Steeplechase Park, the first of what would become three competing major amusement parks at Coney Island, opened in 1896, with its principal attraction a Ferris wheel, an attraction that the Park's owner had first seen three years earlier at the Columbian Exposition in Chicago. After the turn of the century, Luna Park (1903) and Dreamland (1904) also opened and--along with many smaller independent operations--offered a variety of increasingly faster and higher roller coasters, as well as Ferris wheels, carousels and other rides to fuel Coney Island's rapid growth to become the nation's most popular amusement complex. 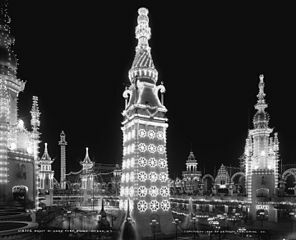 still-novel technology of electricity became a central attraction in itself: Coney Island's Luna Park, for example, was promoted as an "Electric Eden," with over 250,000 electric lights illuminating all its domes, spires and towers and another 20,000 incandescent lamps on its 200-foot Electric Tower in the middle of a lake at the center of the park. Electricity also allowed parks to power rides, extend their hours and increase their accessibility through trolleys. "Electric parks," amusement parks often built by electric utilities or by trolley companies at their hubs to increase ridership during slack weekend periods and generate more revenue from park visitors, soon opened throughout the country. In New Jersey, an Electric Park opened in 1903 in Newark and kept operating until World War I. Typical parks could include a roller coaster, miniature railroad and other rides along with a midway, games and a dining pavilion. Another "electric park" in New Jersey, originally known as "The Park on the Palisades," would grow to rival Coney Island. First opened in 1898 overlooking the Hudson River on the border of what is now Cliffside Park and Fort Lee across from upper Manhattan, the park was first built by the Bergen County Traction Company as a trolley park to attract evening and weekend riders; soon after its opening, it was sold to private investors who expanded it by installing a variety of attractions which included a Ferris wheel and carnival type rides. In 1908, it was renamed as the Palisades Amusement Park, and until it closed in 1971 would be among the nation's best-known parks. Palisades Park also pioneered in adding water attractions to its existing rides and amusements, opening in 1912 a 400 by 600 foot swimming pool--which it claimed to be the world's largest salt water pool--with water pumped from the Hudson. The pool featured water falls at one end, behind which were huge pontoons rising up and down as they rotated, creating a one-foot wave in the pool. At its peak, Palisades Park featured roller coasters, a Ferris wheel, and one of the world's largest choices of rides and games. In 1946 and 1947, however, the Park's carefully promoted image for fun was tainted by civil rights protests over its discriminatory admission practices for its pools, denying entry to African Americans on the basis of a thinly-veiled excuse that it was a "membership" club. Pickets at the Park's entrance were arrested, leading to litigation by the American Civil Liberties Union which after several seasons led to the Park's reluctant move to ease its restrictions. In the 1960s, the Park gained new popularity as a focus of the new rock and doo wop music appealing to teens and younger adults. It promoted live on-site concerts and TV and radio shows hosted by well-known disk jockeys like "Cousin Brucie" (Bruce Morrow) and Clay Cole, with Chubby Checker first performing and dancing his biggest hit "The Twist" at the Park. One of the Park's shows hosted the first-time guest appearances of the Rolling Stones (on a program with one other guest, The Beatles). In 1962, the song "Palisades Park" recorded by Freddy Cannon became the third most popular song in the nation. Indeed, some 45 years after the Park's closing in 1971, the Park's strong identification with the music of its time led Bruce Morrow to host the "Palisades Park Reunion Tour," a series of concerts featuring Chubby Checker, Tony Orlando, Neil Sedaka and others who had performed at the Park. In 1962, the song "Palisades Park" recorded by Freddy Cannon became the third most popular song in the nation. Indeed, some 45 years after the Park's closing in 1971, the Park's strong identification with the music of its time led Bruce Morrow to host the "Palisades Park Reunion Tour," a series of concerts featuring Chubby Checker, Tony Orlando, Neil Sedaka and others who had performed at the Park. Song "Palisades Park" performed by Freddy Cannon. 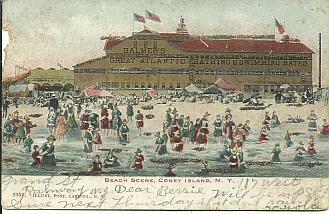 Even before the opening of Coney Island, entrepreneurs in Atlantic City had begun to exploit the appeal to resort visitors of amusements and entertainments. Unlike existing resorts like Cape May to its south and Newport in Rhode Island which hosted lengthy, leisurely summer stays by wealthy families, after its founding in 1854, Atlantic City's market quickly became the lower-income urban workers who came by a newly-constructed railroad from Philadelphia for affordable weekends or short stays. Protected and encouraged by a corrupt political machine, investors in the City promoted a diverse range of experiences--including gambling and prostitution--along with an evolving amusement and entertainment complex centered on its boardwalk. Protected and encouraged by a corrupt political machine, investors in the City promoted a diverse range of experiences--including gambling and prostitution--along with an evolving amusement and entertainment complex centered on its boardwalk. In 1872, a ride called the Encyclopedial Wheel began operating, composed of four 30-foot tall wheels each holding 16 people revolving on a turntable; in 1885, the City's first roller coaster opened, designed by William Somers, the ride's inventor who had introduced the new ride in Coney Island just a year earlier and also built a similar one in Asbury Park. As the City developed, newly-built piers extended its amusements from the boardwalk over the ocean. The first was the Ocean Pier opened in 1891, followed soon by other piers like the Heinz Pier (promoting pickles and other condiments of food entrepreneur H.J. Heinz), the Steel Pier, and the Million Dollar Pier. When Young's Ocean Pier opened in 1906, it boasted of the "World's Largest Ballroom," Hippodrome Theater, Exhibit Hall, Greek Temple, an aquarium and a roller skating rink. The piers actively competed for visitors by offering new rides and attractions. Live entertainment also became a staple to draw crowds; the Steel Pier's diving horse was perhaps the best-known attraction, but the City also became a regular showcase for performances by the nation's top entertainers, including Al Jolson and John Phillip Sousa and his band, as well as pre-opening tryouts and previews of productions which hoped to be staged on Broadway. On a lesser scale, other Jersey Shore resorts like Asbury Park, Long Branch, Ocean City and Wildwood followed Atlantic City's lead in using amusements to complement their beaches in competing for visitors. Asbury Park's initial offerings featured one of the first Ferris wheels built in 1892 by William Somers, who also constructed wheels in Coney Island and Atlantic City, and a carousel crafted by Charles Looff, one of the most prominent American carousel builders. Wildwood's boardwalk amusement area began with a single carousel in 1918, followed in the next season by its famed Jack Rabbit roller coaster, which for may years was the feature of its Playland park that gradually added many other rides. Other shore towns, however, rejected amusements to broaden their appeal beyond their beaches and ocean. Cape May, which was New Jersey's most visited resort in the early 19th century until the emergence of Atlantic City after the Civil War, took a different path. After a devastating fire in 1878 destroyed much of the village, Cape May decided to rebuild its beachfront with Victorian homes and shops but barred man-made rides. Ocean Grove, founded in the 1880s by Methodist ministers as a gathering place for summer religious sermons and services, also banned amusements, indeed barring all motor vehicles from the town on Sundays until its prohibition was invalidated by the state Supreme Court in the 1970s. When the US entered World War I in 1917 at the behest of President Woodrow Wilson, the rapid growth and expansion in the early 1900s of amusement parks and complexes slowed to a near halt. Wartime disruptions of families, losses of workers entering the military, rationing of domestic supplies, travel restrictions and a federal tax imposed on amusements to support the war effort undermined the industry. In 1918, the first national outdoor amusement industry association was founded, lobbying to eliminate the amusement tax and obtain military deferments for park workers. After the fighting in Europe ended, the US, as new President Warren Harding inaugurated in 1921 promised, returned to "normalcy" with a renewed attention to domestic issues and personal concerns. The 1920s economy surged with a booming stock market and a growing middle class with more leisure time; families were able to afford such former luxuries as automobiles, increasing access to resorts and amusement parks. Aided by its reputation as a haven for the open sale of illegal alcohol during Prohibition, Atlantic City enjoyed its peak period of prosperity during the 20s; in March 1929, it dedicated its newly-built Convention Hall--at the time of its construction the largest building in the world without roof posts or pillars. Just months after Atlantic City dedicated its Convention Hall, the stock market crash of October 1929 sparked the Great Depression which would take hold for much of the 1930s. The economic collapse had a particularly severe impact on the amusement park business as families were forced to use whatever money they had to meet their basic needs for food, shelter and health, sharply cutting any spending for leisure or entertainment. By 1933, only 500 amusement parks remained of the over 2,000 which were in operation in the early years of the century. Atlantic City, burdened by debt from building its new Convention Hall, was unable to pay its bills; by the end of the ‘30s, its per capita debt was higher than that of any other city in the country. As the economy slowly improved toward the end of the 1930s, the amusement park industry had a brief recovery which was abruptly halted by the nation's entry into World War II after the Japanese attack on Pearl Harbor in December 1941. Atlantic City was taken over by the military for training of new soldiers, rehabilitation of the wounded returning from abroad and processing forces for reassignment or discharge. Like the experience of World War I, wartime mobilization, including the draft, gasoline rationing and travel restrictions, sharply cut the operations of the few amusements which continued to remain open. Many parks closed permanently. After the end of the War in 1945, the return of soldiers to civilian life brought the "baby boom" which boosted the market for amusements, particularly for "kiddielands" and "storylands" oriented to younger children of the new post-War families. But the boom also spiked real estate prices and suburban sprawl as builders bought up land for housing the newly-formed families. Development pressure led to the sale of some parks, and completion of the interstate highway system and expanded air travel facilitated trips to once-remote resorts. In 1955, Walt Disney opened Disneyland in California, and his concept, later dubbed a "theme park," made older amusement parks appear dated and stale. Television also gave families a new option to spend their leisure hours at home. In the 1970s, an emerging trend in amusement parks began to dominate the industry into the next century--the development of large parks featuring diverse thrill rides incorporating the newest technology. Walt Disney's Disneyland had provided one model of large parks for the amusement industry, but parks which lacked the child and family friendly characters of the Disney brand set out to target an older demographic of teens and young adults seeking more excitement. One of the first of these parks would become Great Adventure, first opened in 1974, after its construction in the forests of Jackson Township in Ocean County on Interstate 195 by Warner LeRoy, the Manhattan restaurant entrepreneur and son of Mervyn LeRoy, the veteran movie executive who produced the classic movie "The Wizard of Oz." In 1977, LeRoy sold his new park to Six Flags, a company which had previously opened parks in Texas, Missouri and Georgia and would grow to become the world's largest amusement park operator. Like the other Six Flags parks, Great Adventure would aggressively promote new rides, particularly giant roller coasters. In 2015, Great Adventure consolidated its adjacent Wild Safari animal park with the amusement complex, claiming that the combined 510-acre park made it the second largest theme park (to Disney World) in the nation. Giant amusement parks like Great Adventure, along with other major parks easily accessible in nearby states, placed competitive pressure on the smaller, more traditional parks and amusement centers in New Jersey. Increased costs from insurance coverage and more rigorous state and federal regulation of safety standards also imposed burdens that some smaller parks could not absorb and led to their closures. As continuing suburban development also drove up the value of real estate, the land occupied by older amusement parks also often became more profitable to be recycled as commercial, retail and housing projects. In 1971, Palisades Park was demolished for an apartment complex. Coney Island also continued its long-term decline, with many amusements shut down as its surrounding neighborhoods increasingly became known for crime and abandoned buildings. As a result of the civil unrest of the late 1960s followed by an aborted oceanfront redevelopment plan, many of the amusements in Asbury Park, including its well-known carousel and Ferris wheel, were dismantled, leaving long stretches of vacant areas. As always, weather remained a key factor in the viability of parks, both in normal seasons in its impact on travel and, most significantly, in damage incurred during severe storms. In 2012, Superstorm Sandy led to the closing of some parks and substantial costs in repair or installations of new rides for parks seeking to reopen after the storm. In July 2016, the owner of the FunTown Pier in Seaside Park, which was heavily damaged by Superstorm Sandy and then destroyed by a massive fire in September 2013, announced that the municipality's refusal to allow a reconstruction plan including rides higher than 100 feet would halt the project since higher rides were essential in attracting younger adults needed to justify his estimated $15-20 million investment. Some of the older parks which did survive attempted to broaden their appeal, such as those which added waterparks to their sites. In a few cases, newer parks pursued niches not served by the larger operations, such as the Diggerland Park in South Jersey allowing visitors to use bulldozers and other construction equipment.